and more brightening your world as never before". I have some wonderful little grandsons (and some granddaughters too of course)! Naturally for a papercrafter, a new baby means making a sweet new little welcome card. I found a sketch that is so versatile, you can use it for many other occasions than making a new baby card, but on this page it's all about babies, babies, babies! The card is divided into two. The sketch I used called for designer series paper on the left and three square embellishments on the right, the two sides to be divided by a fiber. First, pick your images. In my case I chose teddy bears. I started by stamping my three little teddy bear stamps onto glossy white cardstock (you can use matte cardstock too such as Whisper White) and coloured them in with the Soft Subtle range of Stampin' Write markers from Stampin' Up! Then I punched the teddies out with a smaller square punch and mounted them on larger punched squares of plain cardstock. Next I attached a piece of designer series paper to the left hand side of the card front and used individual alphabet stamps to spell out the infant's name. After that I attached the ribbon with double sided tape, or you could run it through a Xyron machine to make it into a sticker. Finally I mounted the square embellishments to the right hand side with Stampin' Dimensionals to make them pop up off the card. 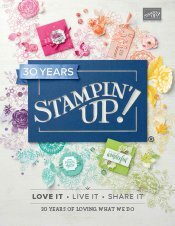 I have used this technique in making a handmade greeting card but you could also adorn a scrapbook page with little detailed stamps mounted on plain cardstock. Use them as accents or make a whole border out of them. The technique would work if you used different images and colours, or even if you small photos instead of stamped images. Imagine it done in pinks or yellows or lilacs. 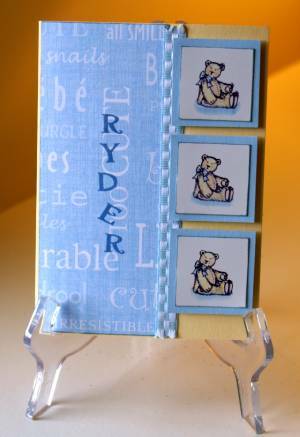 I hope you enjoyed seeing how I made this card to welcome a little one into the world and congratulate his parents. I always make special cards for family and friends. I must start keeping photos of them as well!